Organo vases are made to "appreciate the uniqueness of a single flower"
Moisés Hernández's Organo vases are made to "appreciate the uniqueness of a single flower"
Mexican designer Moisés Hernández has grouped together glass cylinders to create these vases, which are intended to hold a single flower within each compartment. 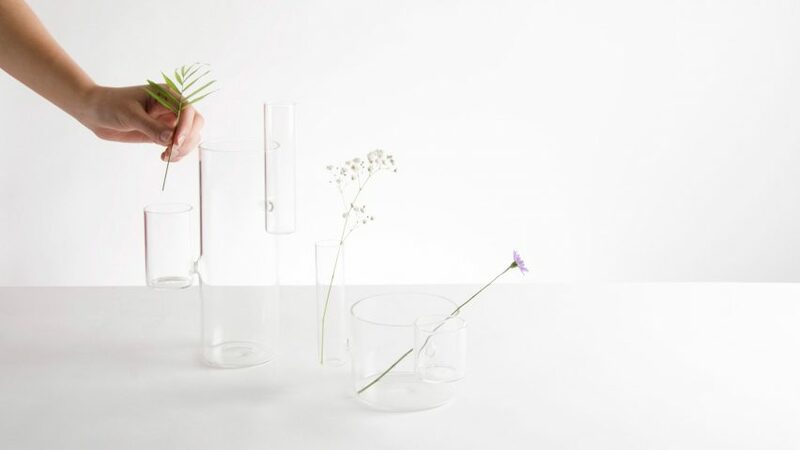 The Organo vases are made from thin borosilicate glass, giving them a delicate and clean appearance. Each vase comprises multiple cylindrical containers of different diameters and heights, arranged to create a feeling of balance and harmony. "I wanted to create a flower vase that could hold different types and sizes of flowers and would display each one in a special position," Hernández told Dezeen. "The isolated containers for small quantities of flowers instead of big arrangements are made to appreciate the uniqueness of a single flower." "The disposition of the containers has rhythm and balance that invites people to play with the position of the flowers," the designer added. Commonly used for test tubes and other laboratory equipment, borosilicate glass is known for its resilient qualities, and has been utilised by a number of designers, including Sebastian Bergne for his Drop carafe and Bec Brittain in her Crane lamp series. Because of its high resilience to heat and stress, it can be used to make thin and fragile-looking vessels. Hernández has further exploited this quality by using clear joins to connect the segments of each vase together, making them almost appear as if they are floating in space. By experimenting with different heights and dimensions, Hernández intended to produce simple and unique flower arrangements. "Placing each flower in a different vase is like deciding which frame best suits a painting," the designer said. "The separate containers create different landscapes, making the water and the flowers look like they are floating." "The vases have a dynamic arrangement of basic geometries to imitate certain plants in nature that grow flowers sporadically in special places." Based in Mexico City, Moises founded Panorámica, a design cooperative that explores new territories and interprets various perspectives and rationalities about design, in collaboration with other five Mexican designers in 2012. Hernández' brand Diario, which he set up in 2013, redesigns everyday objects. Earlier this year, he created a selection of monochrome tableware for acclaimed Mexican restaurant Pujol and released a collection of wooden, dip-dyed birds.